I know. It’s Bold. But maybe that’s what I need to write in 2016. And maybe that’s what you need to hear. The truth. Someone asked me the other day, “do you think I can stay sober while my spouse still drinks at home?” I looked at her the same way I looked at the bank teller last week when I went to make a withdrawal. “I would like take out X amount of money from my savings please,” I asked. The teller left and came back minutes later. “Sir, you have .76 cents in one of your savings, should I withdrawal from the other?” she asked. And that’s the same look I gave my friend who asked if she could stay sober while her husband drinks at home. I get it. We are all different. Some of us can still go to music venues, some of us can still work at bars. However from my experience, I only know one way to stay sober. And that’s full commitment. Which meant for me, real change. I’m very lucky and blessed to have the wife and family that I have! I know, I’m lucky. My wife stopped drinking all on her own when I finally came back home. (How someone can just stop drinking at a moments notice is absolute insanity, just a FYI) But I would not have been able to stay sober without my wife’s support. I don’t know either if I would of stayed or left if she decided to keep drinking, like I said I’m very lucky. But its either it is, or it isn’t. And I’m on the side of that if you want to stay sober, you can not live with someone who drinks or uses and most of all doesn’t support you. There is not even a little trick I know, or a little routine on how to get by when living with a spouse that drinks. No clever sayings or suggestions. Just simply no. It can’t be done. What can be done is your spouse can support you by understanding the disease. By going to a meeting with you. By not drinking or using. I guess it all comes down to, what are you willing to change, sacrifice and let-go of, to get sober? Next postDon’t Drink Today And Come Back Tomorrow. The analogy at the bank is perfect! Unfortunately, there are a lot of relationships out there that the drinking/addiction is the only thing they have in common. It’s a good thing your wife supports what you are doing and it says a tremendous amount about the nature of your relationship! Awesome. Here’s to another day, another 24 hours and more positivity! Thanks for reading, I know, I couldnt believe the teller came back and asked that ridiculous question! So I realized early in sobriety that almost all of my relationships except for my marriage was built around using and drinking. I thought it was going to be hard to stop handing out with friends however when the drugs and alcohol went away, we actually had nothing in common which made it easy to let go. But you gotta hold on, until you get to that point! Thanks for taking the time to read and comment, I really appreciate it! Now off to a meeting to go pick up my 3 year chip! Thanks for taking the time to read and comment. Congrats on your 11 years, that’s truly amazing! Yeah I had to meet my wife all over again, sober. That was challenging, for both of us! Good luck on dating, I would have no idea how to do that, and stay off Tinder!! lol…! My hubbs still drinks often but never at home (he works in hospitality) sometimes it bugs me but I need to remember it’s my journey not his, I can’t begrudge him drinking because I can’t… still.. food for thought. You’re a lucky man, you’re wife sounds amazing. Thanks for the post. Thanks for reading and taking the time to comment. It really means a lot to me. 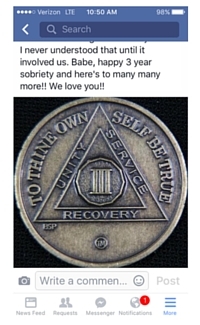 And you’re right, its not about him, its about you and your journey… and mine as well….like I said, everyone’s sobriety is different…and thanks for the compliment to my wife!